A road trip often provides a great way to do some sightseeing and offers a lesson in splatology. That is, the bugs that splat on your windshield and grill make you wonder what kind they were. That big red splat on your windshield, that was probably a female bug that bites, like a mosquito for example. Larger splats are usually caused by moths carrying eggs. Small splats are gnats and small splats that glow are fireflies. According to experts, (yes, there are experts on this subject matter) most insects fly four to five feet off the ground; which makes them perfect striking distance as you travel down the highway. Some bugs, like butterflies, for example, are attracted to the yellow reflector lights on the highway, which lead them right to your front bumper as you are traveling at a high rate of speed. Moths are attracted to your headlights, which is why they fly straight for them. 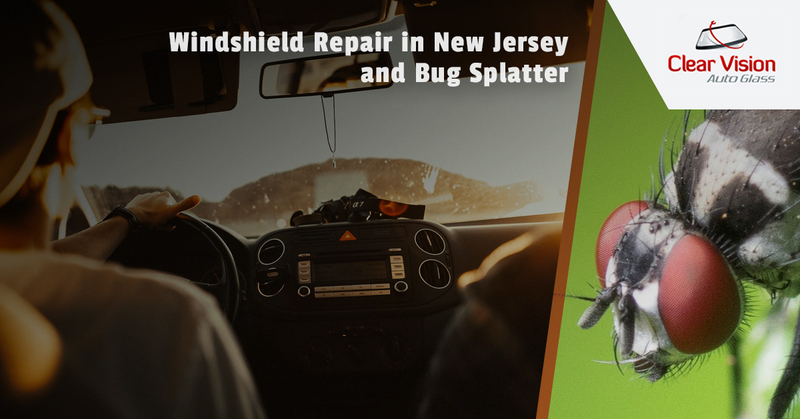 Clear Vision Auto Glass, your windshield repair service in New Jersey, offers some tidbits about the bugs that splatter on your windshield. No matter where you live, thousands of bugs hit our cars every year. Whether you live in the east or the south, bugs are everywhere. And while there is no official bug season, you can expect to hit the most bugs in the spring and summer. The best way to avoid them is to know when they are out. Most bugs are nighttime fliers and are attracted to your headlights. So traveling during the day will result in the fewest splats. When bugs smash into your bumper, grill and the back of your mirrors and aren’t cleaned off right away, there could be problems. Bug splatter is acidic and can destroy your paint job. In addition, bug splatter grows bacteria, (ewwww) which eats away at your car. A good rule of thumb is to give your car a good wash every two weeks. It is especially important that you get a car wash after a road trip. It is also a good idea to wax your car as it will help protect the finish. A quick run through a drive-thru car wash will clean off most of the bugs, but pressure sprays are better. But the best way to ensure your car is bug-free is to grab a bucket and microfiber cloth and scrub them off. There are specialty bug-removal solutions you can buy that do a good job. Use a window cleaner to rid your windshield of bug splatter. Mixing baking soda with water will loosen up that dried-on bug gut goo. If you don’t feel bad about smashing bugs, you should. Every third bite of food you take has been pollinated by an insect. Veggies, fruits and nuts, you couldn’t have any of them without the services of an insect. So think about that while you are traveling down the highway at a high rate of speed trying to avoid the insects. And if you notice a crack in your windshield while scraping the bugs off of it, call Clear Vision Auto Glass.